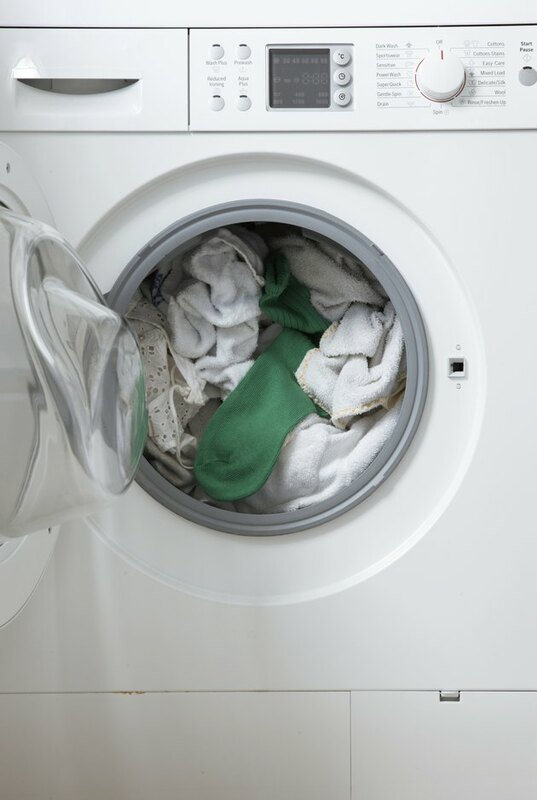 Front loading washing machines are almost as well known for the mold that settles on the front seal as they are for their energy efficiency and gentle treatment of their loads. Once mold settles on the seal, it's tough but not impossible to remove. Once the rubber gasket on your machine is mildew free, develop cleaning and maintenance habits to keep it that way. Keep the washer door open when you're done with laundry. Put your fingers inside the gap in the rubber gasket and pull forward to make sure there is no debris or bits of wash trapped inside. Scrub the gasket with a household mold and mildew scrub. Pull the drawer to the laundry dispenser open as far as it will go. Look for a tab that releases the dispenser. Push down to release the dispenser completely. Check for mold and mildew. Scrub the dispenser until all soap film and mold are gone. You might need a toothbrush to get into tight areas. Run another cycle, using vinegar instead of bleach to deodorize the machine. Run a third cycle of water to flush the machine. Maintain your machine by using a specially formulated washing machine cleaner every month or every other month. You can also use 1/2 cup of bleach in a normal hot wash cycle. Some machines have a clean or sanitary cycle that should be used with bleach for maintenance.